Her intent is to portray the essence of natural forms. Cornelia Kubler Kavanagh is a daughter of noted art historian, George Kubler. Not surprisingly, she was nurtured in an environment rich in the visual arts, extensive travels abroad and schooling in Europe and Latin America. Although she had imagined working as an artist after college, she taught history while raising her family, before beginning to realize her life-long passion to become a sculptor. Teaching herself to carve stone in the Modernist tradition of Arp, Hepworth and Moore, Kavanagh gradually developed a style of her own characterized by rounded, biomorphic shapes. As demand for her work increased, she began inventing ways to carve polystyrene, and to finish maquettes with plaster or aqua resin for casting in bronze and aluminum. In 2005 Kavanagh represented the United States Virgin Islands Council on the Arts at the 51st Venice Biennale with several sculptures honoring her father’s seminal treatise on art history, THE SHAPE OF TIME. Her “Shape of Time” sculptures addressed such diverse subjects as Chacmool, the Toltec-Maya recumbent rain god that inspired Henry Moore, and Aevum, a notion attributed to St. Thomas Aquinas that Kubler described as “the duration of human souls, intermittent between time and eternity, having a beginning but no end.” Castings of Aevum are located in the lobby of the Smilow Cancer Hospital at Yale-New Haven and in the new University Hospital of Princeton in Plainsboro, New Jersey. While working on a series of muse sculptures, Kavanagh was so distressed by the devastation of the Banda Aceh Tsunami of 2004 that she directed her attention to attempting to reconcile the paradox of water as life force and agent of destruction. She carved a series of tsunami waves that was first exhibited at the Blue Mountain Gallery in New York in 2006. This exhibit marked a turning point in her career as she had, by then, determined to focus on environmental issues in hopes her work might help raise consciousness about the health of our oceans. While working on the Moulin sculptures, Kavanagh began wondering how countless millions of gallons of onrushing melt water was affecting marine life at the edges of calving glaciers. Eventually, her inquiries led to the discovery of a beautiful microscopic marine animal called a pteropod (also known as a sea butterfly). No larger than a grain of sand, pteropods are potentially subject to harm from rising levels of ocean acidification caused by CO2 emissions. Delighted that pteropods evoked images of Arp, Miro and Kandinsky, Kavanagh felt she had discovered an ideal surrogate for the health of our oceans, and she began to carve abstract interpretations of these beautiful tiny creatures, some enlarged up to four hundred times. 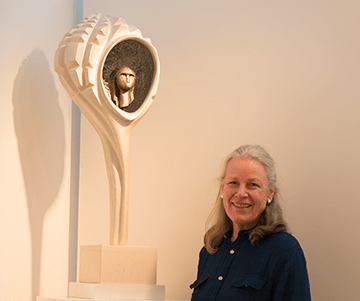 Questioning whether her maquettes were sufficiently representational as to be recognizable, Kavanagh met with Dr. Gareth Lawson of the Woods Hole Oceanographic Institution (WHOI). Thinking a fine art exhibition would be a compelling form of outreach, WHOI decided to collaborate. In May of 2012, “THE PTEROPOD PROJECT: charismatic microfauna” was shown at Bule Mountain Gallery in New York. Although her abiding sensitivity to natural shapes and her passion for portraying the essence of living forms will likely always find expression in her work, she recently completed a “celebration” of the so-called “Venus” figures, the first known three-dimensional representations of the female form, carved during the Late Stone Age by Cro-Magnon hunters and gathers between 40,000-10,000 BCE.